Looking at our family, I must say that technology has brought a lot of comfort and advantages. For one, cold water from the refrigerator refreshes a tired body and soul the same way that a newly heated food from the microwave brings comfort to us. Now with our automated washing machine, I could give justice to multitasking. As I wash our clothes, I could put our toddlers to sleep and even work on some articles to finish. Thus, I am always excited whenever new products are introduced in the market. That means added convenience, comfort, and of course, undeniable happiness. Recently, our favorite appliance Whirlpool launched three new products in the country. This washing machine features a Zen direct drive inverter technology which allows a quiet yet high wash performance. It has a hot wash feature, too, that heats the water up to 45°C to remove various stubborn stains and allergens. Despite its high-end features, this washing machine ensures high energy savings. Plus, this unit is supported by the lab test done by FAST Lab showing the low bacterial count after just one wash cycle. This revolutionary appliance has a fresh lock feature which automatically adjusts the temperature to maintain the freshness of fruits and vegetables. Its freeze lock, on the other hand, reduces freeze burns. It also has a FlexiFreeze compartment which allows one to choose three various temperature levels depending on the food to be stored. It is also equipped with Whirlpool’s patented 6th Sense Technology which maintains the optimal environment of the food inside. Built with an integrated handle and touch-screen design, this model is suitable even for first-time users. It has a 30liter capacity and includes a grill and steam function. Indeed, this microwave oven is so flexible for all kinds of cooking needs. 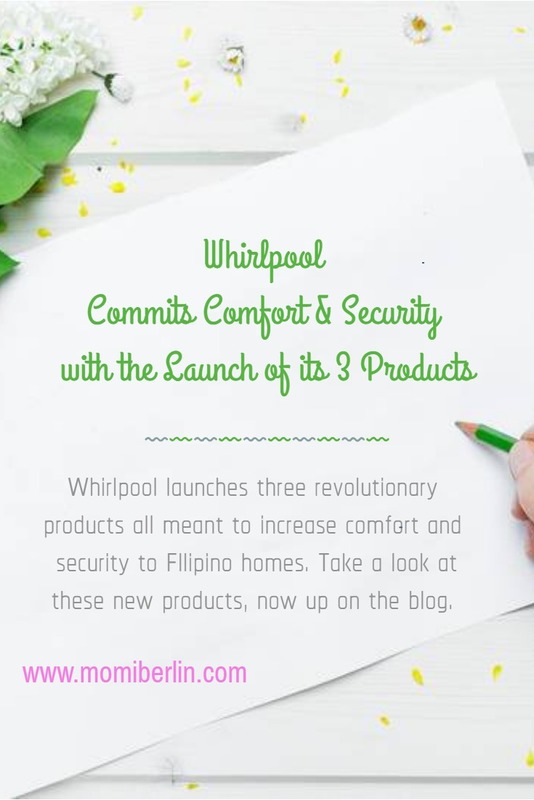 The three newly launched Whirlpool products are all meant to increase the comfort and security of every Filipino. After all, it has always been the goal of Whirlpool to provide energy efficiency along with the high-quality performance the brand has been known for over 100 years. Its managing director for Southeast Asia Mr. Blanco Wong shared that Whirlpool’s plans include innovative features and better quality suited for the different needs in the Filipino market. The Whirlpool Bloomwash Inverter Plus Washing Machine, Quattro French Door Refrigerator, and MWP 305 ES Vancouver Microwave Oven are now available in all leading appliance stores nationwide. We used to have a Whirlpool microwave oven and it lasted for years! The whirlpool inverter washing machine looks promising, we need this to save on electricity since we do laundry almost everyday.